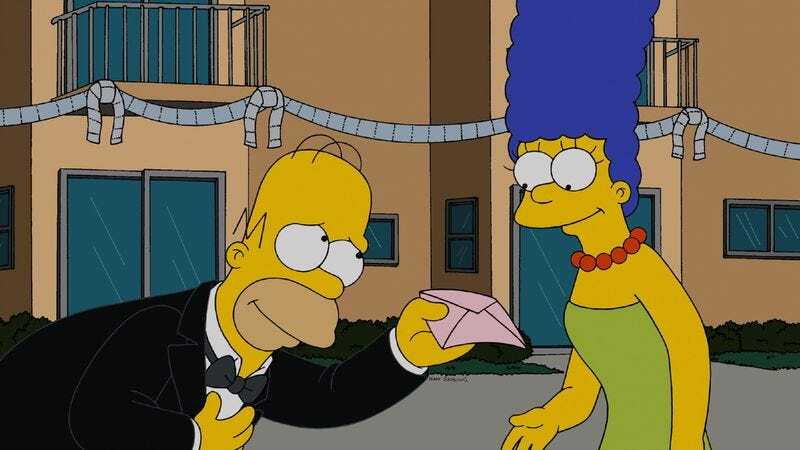 I doubt that there’s supposed to be a meta meaning to the title of this Valentine’s Day-themed episode, but “splintered” accurately describes The Simpsons of late. Nearly a decade ago, Family Guy was the odd man out on Fox’s animation slate, stressing cutaway gags and celebrity impressions while The Simpsons and King Of The Hill mined more humor from characters interacting in recognizably human ways. Now, Bob’s Burgers is the Sunday-night misfit—not so much because it’s realistic but because it gets laughs from committing to a premise and escalating it in unexpected ways. (Gene’s transformation into a mini version of Bob being a recent highlight.) Meanwhile, The Simpsons joins Family Guy in quickly wringing obvious jokes from pop-culture references as it half-asses its way through a story. “Love Is A Many Splintered Thing” picks up where the season première left off and reunites Bart with girlfriend Mary Spuckler (voiced by Zooey Deschanel). The 13-year-old is back from New York and living in the family shack with parents Cletus and Brandine and assorted grotesque siblings. Mary quickly feels neglected by Bart and breaks up with him again, then Marge kicks Homer out of the house for the same thing. Father and son hang out for a while at a crummy hotel (“Brokewood Apartments”) for men on the outs with their wives. They all watch a British rom-com (Love, Indubitably!) that inspires them to wear tuxedos and be nice to their wives. 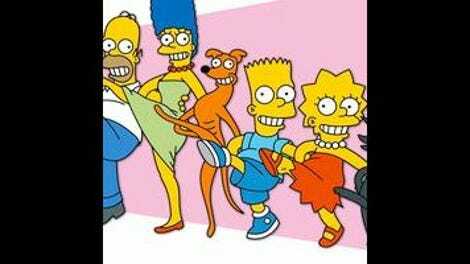 Everyone is happily re-coupled except for Bart, because Zooey Deschenal can’t be around every week. The end. The episode is framed by an Annie Hall parody, with Bart in Woody Allen glasses and stammering directly to the camera about his women problems. (“Like a schmuck, I treated her like day-old matzoh.”) The “real” Woody Allen (but not voiced by the real Woody Allen) later shows up for the joke of Bart not knowing who the hell he is—until Allen mentions his role in Antz. There are also jokes at the mild expense of National Public Radio (and folk music archivists), the Incredible Hulk films, Larry the Cable Guy, The Full Monty, and Alan Rickman. We also get actual guest stars. An animated version of Late Night With Conan O’Brien bandleader Max Weinberg appears so that the words SPRINGSTEEN NOT AVAILABLE can be slapped under him. Benedict Cumberbatch lends his British accent to Love, Indubitably. And the background “music” for a party at the Brokewood Apartments is the audiobook of Robert Caro’s The Passage Of Power, part of his multivolume Lyndon Johnson biography. According to Fox, that’s really Caro reading about the shell-shocked people on Air Force One following the Kennedy assassination. That’s being a good sport, Robert! But why? Well, why any of this? Family Guy ethnic humor: Bart and Mary are in the Spucklers’ “boyfriend room” when they’re interrupted by two of her sisters, waiting to practice kissing with a gigantic, redbearded “French-Canadian mountain man” in shackles. “Où est la whiskey?” he shouts. Lisa on how women feel about being taken for granted: “Aside from being lumped together and generalized about, it’s the one thing all women hate.” This was not part of a Community-type detour into a parody of a hacky studio-audience sitcom. Homer is shown holding a copy of Magazine Holders’ Magazine, with a front cover showing a man reading Magazine Holders’ Magazine. I will concede that most TV critics would have considered that a brilliant sight gag if it were on Police Squad! in 1982. I did like Mary’s “jugband samba fusion” song about her breakup with Bart.